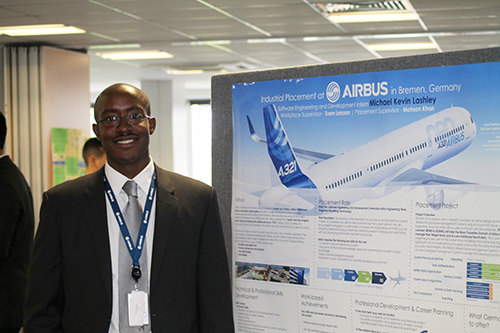 City students returning from their industry placements took part in a poster competition on 16th June to demonstrate their work experience and achievements. On 16th June, City University London's Northampton Suite was the venue for a 'professional communications' poster competition, as students from the School of Mathematics, Computer Science & Engineering returning from year-long industrial placements in a variety of industries, demonstrated their work experiences and achievements. Organised by the School's Professional Liaison Unit (PLU), the event provided an opportunity for students to express how they have developed on personal and professional levels within a relatively brief span of time. Staff and students were invited to be present during the competition and to meet industrial placement students and their employers to learn about the work they have been involved with. It provided an opportunity to show how students have applied theoretical knowledge to real-life business problems and situations. Third Year students, Michael Lashley (BSc Computer Science), and Shakeel Akhtar (BSc Software Engineering) respectively, emerged as First and Second Prize winners. Lashley is doing his industrial placement in Bremen, Germany, with aircraft manufacturer Airbus as a mass modelling engineer. He has assisted Airbus in the areas of information management, relational data bases and graphical user interfaces. 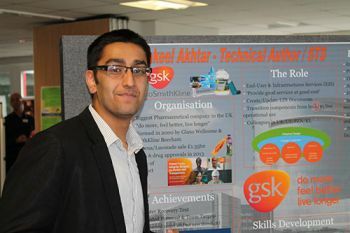 Akhtar spent his industrial placement as a technical author and service transition specialist with pharmaceutical company GSK in Stevenage, Hertfordshire. "It was fantastic to see how our students have developed on a personal and professional level and how easily they networked with the employers who attended the poster competition event. In some instances, some of our students who joined the placement scheme as timid, shy and lacking confidence, returned to City as determined, confident and professional individuals who were looking forward to completing their studies and entering the world of work. Before their placement this would have been extremely daunting. It's always a pleasure to see this transition, and I'm proud to be in a position that enables students to develop their employability through professional experience."